TAMPA -- It's a cool morning in suburban Valrico when a small team of Hillsborough County code officers descends on a house with a broken fence and weeds as high as a man's head. Bill Langford, head of the county's special code enforcement team, breaks out a portable drill, starts replacing wood and fixing the lock on a privacy fence that surrounds an algae-covered swimming pool. Another team member rides a bush hog over the dense vegetation that once was a lawn. Hours later, the pool is still a pond of green slime, but at least it's secured so that kids from a nearby school bus stop won't drown in it. The shorn lawn is less of an eyesore, and the team can move to another of the thousands of foreclosed homes that have been abandoned since the housing market crashed in 2007. "Our plan is not to continue to maintain that property," Langford said. "We will monitor it, but we hope the banks will get it through discharge of bankruptcy and take responsibility for it. But we want to get it to a degree where it's not a major detriment to the community." 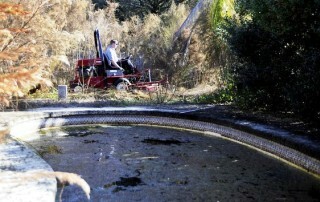 Jonathan Williams mows the heavy growth of grass near an algae-covered swimming pool at a foreclosed and abandoned home in Valrico recently. Williams is part of the Special Enforcement Unit of Hillsborough County Code Enforcement. homes registered will likely grow dramatically under amendments to the ordinance county commissioners will consider Jan. 19. Many of the homes currently registered are abandoned by the owners, and no one picks up the maintenance. Lenders are prohibited from taking possession and maintaining a property until the foreclosure is finalized in court, a process that can take years. It is code enforcement's job to monitor the abandoned properties and force owners to maintain them. But as the number of abandoned homes exploded in 2008 and 2009, the agency was overwhelmed and unable to track code violations. In response to the problem, county commissioners passed the Abandoned Property Registration Ordinance, which took effect Nov. 2, 2009. The law requires lenders who foreclose on properties to register the foreclosures with the county. "This is to make sure we have somebody to reach out to," said John Ferdon, senior business analyst with code enforcement. "When all you have is a bank and an address in New York City, it can be hard to find somebody to get something done." The proposed changes would require all foreclosed houses to be registered whether or not they are vacant, and the ordinance would apply retroactively to foreclosures filed before Nov. 2, 2009. The vacancy requirement is one reason the number of homes registered with the county trails so far behind the number of foreclosures filed with the clerk of court's office. In 2008 and 2009, the years and months leading up to the start of the registration requirement, 42,567 foreclosures were filed with the clerk's office. "A lot of the foreclosures are filed with people still in the house," Ferdon said. "Removing that vacancy requirement is going to significantly increase that number." The county hasn't gone out of its way to enforce the registration requirement. Lenders register the foreclosures on the county's website. Most of the big banks know this and understand the requirement. "I want to try to work with the clerk on some sort of notification system so (lenders) understand what the requirements are," Ferdon said. Failure to register will be handled like any other code violation, Ferdon said. The recalcitrant owner can be taken before the code enforcement board and fined up to $1,000 for each day out of compliance. If the owner doesn't pay up, the county can put liens on the foreclosed property or any other properties the lender owns in Florida. But levying fines and collecting them are different things. In a foreclosure, the county's liens for maintaining an abandoned house rank well below claims from other creditors. "The fact that a foreclosure has occurred does present a problem and a bar for us," said Charlotte Diggs, an assistant county attorney who handles code enforcement fines. "Many times there's nothing to collect because of the priority of liens." Since May 2007, the county has collected just $191,747 of the $19.6 million in fines levied in code enforcement actions related to foreclosed homes.